Karla was born in the Peruvian Amazon and grew up on a tropical homestead which connected her deeply to her culture and landscape. Her early appreciation for the environment ignited a passion for fostering a culture of ecological awareness, respect and interrelationship. This led her to study at UVM where she received an Environmental Studies degree. She then worked on an organic agricultural farm and was an environmental educator. 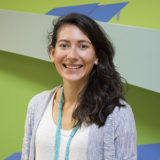 Karla is grateful to be a part of an organization with a mission is to help Vermonters divest from fossil fuels by connecting them to renewable energy! She enjoys inspiring and empowering others to also go solar. Karla lives in Stowe and loves living so close to the mountain where she can snowboard in the winter, explore swimming holes in the summer, and hike in the spring and fall.